I painted this with Caran d’Ache Neocolor II watersoluble crayons on plain old cotton fabric (muslin). It was so much fun, and so zen. I’d like to incorporate this, or something like it, into an art quilt. It reminds me of the abstract landscape work I’ve been doing in my art journal (with the same crayons)! I’d love to get your thoughts on this fabric piece. Am I on the right track, do you think? Could you see this as part of the focal area in an art quilt? It dried lighter, as water media usually does, so I think it needs to be punched up a bit first. And I didn’t make it wide enough either – I wouldn’t leave the white spaces on either side if it was going into a quilt. Just didn’t have time to redo this one. What kind of feelings does this piece evoke? And please don’t be shy. If you think it wouldn’t work, any hints on what’s wrong or how I could make it better would make my Friday! I hope you all are shaking your various talons, tails, whiskers and tail feathers on this wonderful September Friday. Peace. I really appreciate your feedback, Kerfe. It’s about 9″ tall by about 7″ wide. I was thinking about maybe cutting it into squares and re-sewing it too! This one was an experiment to see how they worked on fabric, and I was so impressed by how easily the color went down, buttery, with no dragging. So now I’d like to do another, larger piece. I have almost zero experience making art quilts, but I guess some sketches are in order. I tend to do everything spontaneously and unplanned, because this is how my arty side works. I think what I ultimately want though is a scene like this with a sky and then water below. So I was thinking why cut it up and sew it back together to get back to the same scene? But that’s my first instinct too. Patchwork. Because that’s always how I’ve approached most every (traditional) quilt I’ve made. I’m wondering now if strips is the way to go with this design. Then my next thought is should they be vertical or horizontal?! Every decision, I could hem and haw for a year! This is why in the past I’ve followed a pattern. Making fabric decisions was hard enough. But I want to create original designs. Argh! Welcome to my disorganized mind. :)) Thanks for your thoughts! I hear you. I like to work spontaneously too, but I often have a rough sketch or idea in my head at least. It seldom ends up that way though! All your ideas sound good. Plunge in and see what happens! It would never occur to me to paint on fabric. Good job! Thanks, Kirk! Does this give you a similar feeling to the abstract landscapes in my journal that you’ve liked? I’m trying to convey similar feelings here on fabric. There are so many possibilities, I say make more with different color combos and then combine them. The first idea that came to mined was cut in strips and weave the fabric. Looks like you have a fun project ahead. Wow, never even thought of weaving, Sharon, that’s a very cool idea. Thanks! I definitely need to make more. :))) Painting the fabric is so much fun. Have you ever tried it, Sharon? Yes, I’ve painted fabric with fabric paints, acrylic and I’ve used my printer to print out color designs on fabric. It’s all so much fun. Very nice, particularly the “sky” coloring. Thank you, Frank! I’m glad you like it! It almost looks like a sunset, so its very peaceful to me. I’ve never even heard of an art quilt, lol, so I can’t be much help there, but whatever you do I’m sure will shine! I have no experience with painting on fabric. But on my to do list. Will you have to fix It in some way. I have seen people use inktense pencils for fabric. I would like to see one of your birds in a square for a quilt. Although I know you like abstract. An abstract bird maybe. I’m learning more about that fixing aspect now, Carmel, and I’ll definitely include what I learn in future posts. I like your abstract bird idea – I just got an idea for a painting I could do in this vein that would incorporate an abstract bird. Thanks for that! Maybe you’ll see it soon. 🙂 I appreciate your feedback! I think it’s a great idea! I wondered also about fixing the colors. I’ve seen some use wax to fix watercolors on paper. I wonder if it would work on fabric. I have some Annie Sloan wax I used to paint my kitchen cabinets so I might give it a try. And I’ve also seen quilters use inktense to draw and color. Good luck! Thanks, Kari! I found a link on the web of an artist who used watered-down textile medium to fix watercolor paint to fabric. I haven’t tried it yet, but I plan to. I also know the Neo II crayons can be fixed by ironing. Art quilts aren’t meant to be washed, but I think it’s useful to know what fixes them. I have Inktense blocks and pencils and I’ve used them on fabric, but not tested to see if they hold up to a washing after. I do find them grainier than the Neo IIs. Love their bold colors, though! I didn’t know about the fixing Neo II, that’s good to know! I love my inktense blocks. You’re welcome! And thanks again for the Lyra tip. :)) I hope it helps you! I’ll be really curious where this project goes. I hope to find out this weekend! I’ve always wanted to make my own textiles = fabrics. I think this is lovely. It reminds me of a sunset or sunrise over the sea. I’m looking forward to seeing where you go with this. This is gorgeous Laura! It evokes feelings of the peace and happiness of looking out over calm waters. I have no experience with art quilts, so….I will say what I always say. DO it!! DO it!! Hehe… I’m sure it will be lovely! Thank you, Charlie! I was really curious what you would think of this also, since you’ve enjoyed my abstract landscapes. To me, this is just a translation of the same idea to fabric. I would still like to use real WC paint on good paper and see how this turns out as well. Thanks for your support (as always). Thank you for your enthusiasm and encouragement, Charlie! I did try it tonight. I wound up adding the crayon to the watercolor. I’ll try it again tomorrow when I’m more awake! Sometimes making art after a long day can be counterproductive. You’re so good at the area you’re currently working in. You could do them if you kept trying but why abandon something that’s working for you in order to do it? If you can do furry animals, I have no doubt you can do portraits. I’ll try and remember the artist Lance told us about – Jill took lessons from him. Stan White maybe? He has excellent youtubes on WC portraits. Makes it look very easy! I can do colored pencil portraits pretty well, but the thought of even trying in WC still bugs me. You can do it, Charlie. 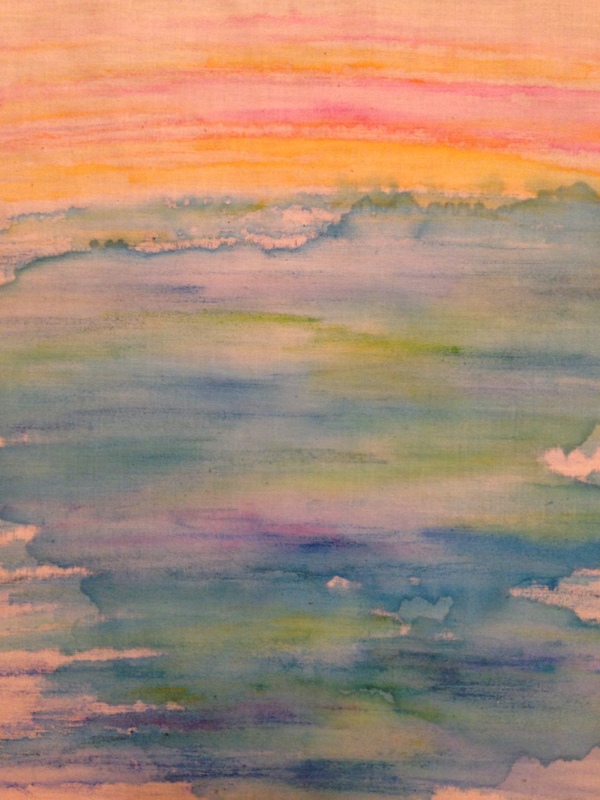 I think of a sunset when I see this painting – the rainbow of life. Deserves to be part of the art quilt. Thanks, Mary! I think I will do more layers to deepen the effects, and then see where it wants to go from there. I really appreciate and value your feedback! I agree with Mary. I see a sunset over an ocean isle. Beautiful! Thanks Jill! Yes, definitely adding stitching. This fabric actually feels no different than before I painted it. I only used neocolor crayons and nothing else. I don’t think there’s any watercolor paint in this one at all. I think the neos are permanent once ironed. I used no textile medium, but if I were using acrylic I’m sure that would help. Art quilts aren’t meant to be washed so I may just iron this fabric and let it be – once I’ve added another layer. I’m really happy (and surprised) with the hand of this piece. Maybe when I add another layer, it’ll change? Guess I’ll find out! Love those neos. Been painting tonight with them and totally loving them!! Thank you so much Debbie!! I’m so glad you like this!! I have no knowledge of quilting so can’t help you there but I really like the bottom half of this – reminds me of Monet. Ooh, thank you, Nicola for that very kind compliment! I do like the watery feel to this. I love my Neo IIs and rarely use regular watercolor but never considered using them on fabric; wow! Thanks, genie! Glad you like it. I’ve fallen totally for those Neos! So behind in admiring your work! Love this idea… love this fabric creation. I can totally see this as a quilt. Will you be printing your own fabric? Or taking inspiration from your painting? Thanks, BB! Not planning on printing fabric, just painting and maybe distressing/other mixed media effects. Glad you like it!